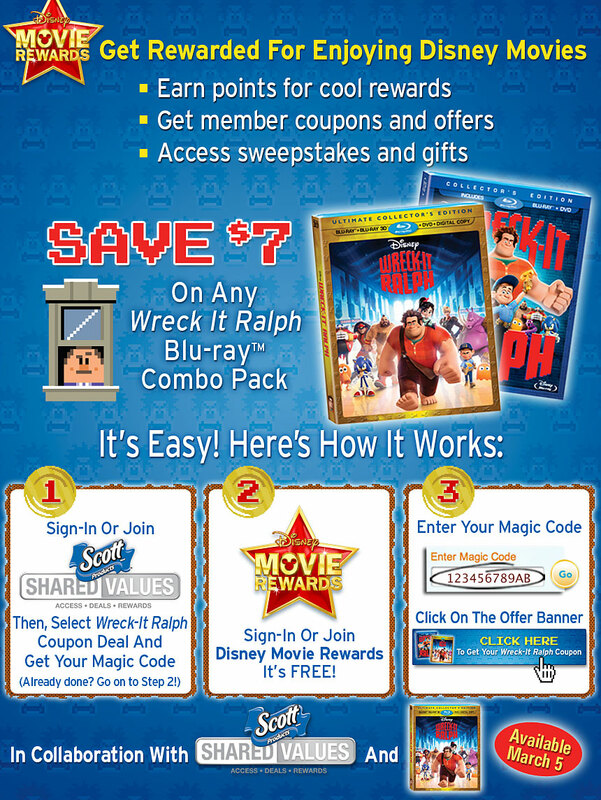 Save $7 on Disney’s Wreck-It Ralph Two-Disc Blu-ray Combo or Four-Disc Blu-ray 3D Combo Pack. The 3D-animated family comedy arrives on March 5. Walt Disney Studio Home Entertainment and Scott Products are offering a $7 off printable coupon redeemable at participating retailers. Click here to get the coupon. Wreck-It Ralph features an all-star voice cast that includes John C. Reilly, Sarah Silverman, Jack McBrayer and Jane Lynch. For decades, Ralph has played the bad guy in his popular video game. In a bold move, he embarks on an action-packed adventure and sets out to prove to everyone that he is a true hero with a big heart.